This article is a short summary of Mario & Luigi: Bowser's Inside Story + Bowser Jr.'s Journey. 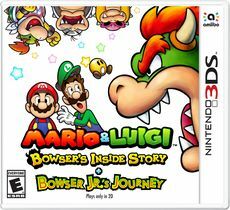 Mario & Luigi: Bowser's Inside Story + Bowser Jr.'s Journey is a Nintendo 3DS remake of the Nintendo DS RPG Mario & Luigi: Bowser's Inside Story, following up on Mario & Luigi: Superstar Saga + Bowser's Minions. The game was released in Japan in December 2018, and is slated for release worldwide in January 2019. Overall gameplay is similar to other Nintendo 3DS titles in the Mario & Luigi series, featuring updated gameplay while retaining the structure of the original game. The game features a new mode starring Bowser Jr., which plays similarly to the Minion Quest mode in Mario & Luigi: Superstar Saga + Bowser's Minions. ↑ ProsafiaGaming (September 13, 2018). Mario & Luigi Bowser's Inside Story 3DS Release Date Trailer Nintendo Direct 2018. YouTube. Retrieved October 13, 2018. ↑ Hira. (September 14, 2018). 新たに描かれる、わがままぼっちゃんの冒険譚！『マリオ＆ルイージRPG3 DX』に収録の『クッパJr.RPG』をご紹介。 Nintendo. Retrieved October 13, 2018. ↑ Nintendo UK. (September 13, 2018). Nintendo Direct - 13.09.2018. YouTube. Retrieved October 13, 2018.